Now that school is back in session, and things are settling down, we have an idea of how our classes are going to be, what we will be needing, and stuff we like having with us while in class. Above are some of my favorites during the school year, things that keep me organized, ahead of the game, and awake for my classes! 1.) A Planner: I'm a very visual person, so if I hear something is due on so and so date, I NEED to write it or it'll literally slip my mind the next day! Also having a planner helps me feel organized, and on top of things, leading me to good grades. 2.) Seeing is believing: aka some specs! I normally wear contacts a great amount of time but giving my eyes a break and wearing my glasses is great too, not only is it a fashion accessory, but you can see the board clearly! 3.) A tote bag: I'm not a backpack person, I don't like the bulkiness of it, or the way it's strapped on my back, because here in the 956, you sweat, so a backpack sweat stain isn't something I want to be sporting. Aside from that, there are so many cute totes, and they are totally versatile, I just ordered this one above from Ban.do! 4.) Coffee Tumbler: Coffee is a college students best friend ... literally. 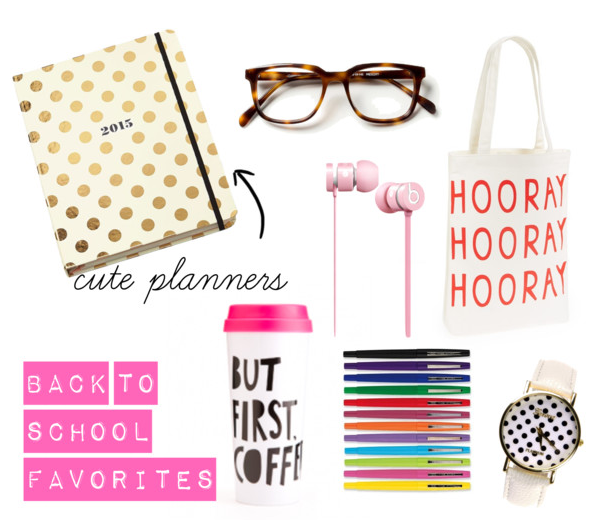 So what better way to lug your coffee around than in a cute tumbler! So many to choose from but the one above is one I got from Ban.do as well. 5.) Colored Pens: to each his own right, but to me colored pens are an absolute essential in my classes, I color coordinate each day of notes in a different color, it keeps my mind organized and knowing what day we did what. Without colored pens or highlighters everything looks like a big boring blur. 6.) A Watch: Every girl needs a cute or good watch, as a perfect accessory and so you won't be late also! A cute way to be punctual and fashionable. These are just a couple of my favorites, and there are tons of varieties of my favorites in different brands and styles, pick your own and rock this semester. Good luck everyone!